There’s no doubt about it. Since coming onto the scene just a few years ago, companies like Uber and Lyft are drastically changing how we get around our cities. Even a venerable institution like a yellow New York taxi cab isn’t safe from the disruption. Transportation network companies have made getting around the area cheaper, faster, and less of a hassle. As cruisers, that’s good news. 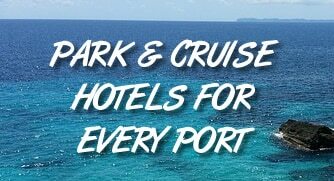 More and more cruise passengers are opting to use these services to get from the airport to the cruise port, or from their hotel to the port. Currently, the services cover the entire New York City area, including airports and cities in New Jersey. That means no matter which airport you fly into or which hotel you stay, you are likely in the service area and can get a ride. Note: Uber/Lyft are available in much of the New Jersey area. The region shown above is just what they consider their “New York” service area. The service is available everywhere from Newark to Paterson, Elizabeth, and New Brunswick, including points further from the city. Basically if you consider yourself to be in the New York area, then you can catch a ride. Sailing from New York City also has another advantage with Uber and Lyft. Rides with these services see an extra charge if a trip takes you over state line between New York and New Jersey. That means cruisers flying or staying in New York but sailing out of Cape Liberty see an extra $20 tacked onto their fare (Uber) or $15 (Lyft). But if you are flying/staying in New York and sailing out of the Manhattan Cruise Terminal, then you don’t have this extra charge. Instead, you’ll get more affordable rates than if you were sailing out of New Jersey. To give you an idea of the rates you can expect, we’ve rounded up estimates from popular spots in the NYC area, as well as a comparable taxi estimate. If you are not already and Uber or Lyft user, you can sign up in minutes by downloading the app to your smartphone. The entire process run through the app. You’ll request a ride from the app and pay via your credit card information stored in the service. This means you don’t have to carry cash and no money is exchanged directly with your driver. Manhattan Terminal Cruise Hotels — Getting in late? Leaving early? Simply need a place to rest your head? We’ve rounded up the options for places to stay near the port.